I survived the day, although it is not quite over with yet. it’s been a bit of a challenging time for me recently so I thought I would engage in a little counting of my accomplishments. After all, that is what I started this blog. At the beginning of the year, I made a resolution to create one item of clothing a month. I have happily surpassed it. Me Made May has helped me realise how many clothes I’ve actually made. I am very proud to say I have now completed more than ten items of clothing. I made this at a workshop, not long after Crafty Sew & So opened in September. There’s a zip along the side seam, I haven’t inserted a zip since! I’m planning on added a pocket to the other side seam. I picked up the mid-weight cotton from Leicester Market. This is the first item of clothing I made on my own, it’s a really simple Victory Pattern called Roxette. I love the detail in the collar. I want to make it again in a floaty material, maybe viscose. I picked up the material and pattern from Crafty Sew & So. This was my very first attempt at sewing with jersey, It worked out pretty well, the fabric is lovely and soft. 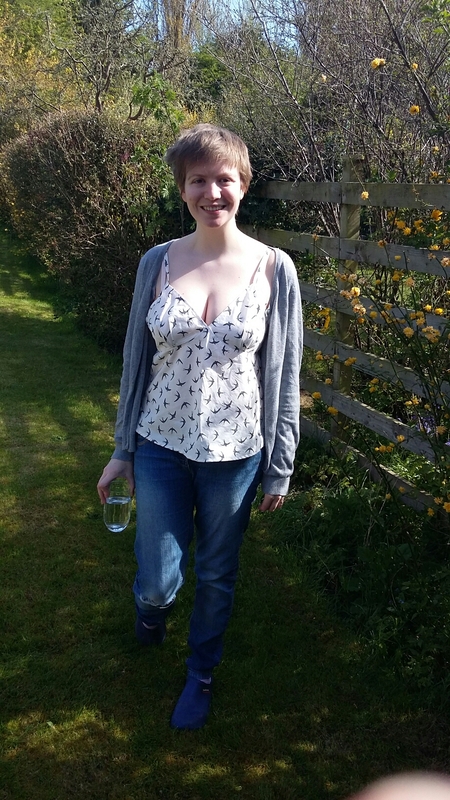 I used Tiny Pocket Tank pattern from Grainline Studio, Sarah helped me add a bust adjustment so it fits perfectly. Once again material and pattern from Crafty Sew & So. My second attempt at the Fifi Pj top went much better. The fit is so much better. Because I had to undo the french seams so many times last time I decided to use normal seams this time. It was a lot quicker and required very little unpicking. I was brave and wore it as a day top. The swallow print cotton was is from Crafty Sew & So. I am very proud of this dress. I have worn it a lot, though can’t seem to find a picture of me wearing it. The delightfully named pattern is Dottie Angel Frock from Simplicity, New Look. I saw it in Mollie makes and grabbed it in the sale online. It was a bit of a shock to go from the nicely laid out and clear independent patterns to the convoluted and quite frankly confusing layout of New Look pattern. After playing around a lot with masses of bias binding I created my first dress. I added some pretty embroidery around the neckline and the joining line. I decided to make it just that little bit harder for myself and add pockets. It was simple enough but one is slightly smaller than the other. The polka-dot cotton is from Crafty and Pattern from Simplicity. I was very confident when I started making this top as the first Tiny Pocket Tank went very well. However, my impatience was my downfall. This jersey was a lot lighter and slinkier than the first tank top, I attempted to use my normal needle and got into a bit of a mess. I also ran out of black thread and only had white. I attempted to continue nonetheless and had to unpick this very fiddly fabric. I brought jersey needles and black threads and forced myself to sit down and finish the top. It feels luxurious to wear. Though I did manage to stretch the neckline a little so normally wear it with a vest top. Jersey needles, black thread, fabric and pattern all from Crafty. I found my second attempt at this dress a lot easier, though I did manage to lose the second page of instructions so had to make it by memory. I’ve made the dress a lot shorter for the summer, just above the knee. I think the beautiful big pockets make a great focal point. I picked up the stage print from a gorgeous shop in Lutterworth called Sew Charming. I made some envelope cushion covers with the cotton a little while back and had enough left over for the pockets. The denim was from Crafty. This is me very very excited about having made my tenth item of clothing. It’s made from a lovely soft ponte roma jersey. It’s another pattern from Tilly and the Buttons called Coco and i absolutely love it. There are loads of variations, dress length, three-quarter legnth sleeves, cowl neck and sleeve cuffs. I have so many plans. I made this in a workshop at crafty, it was almost exclusively done on the overlocker! Whilst writing this I realised I made another top a little while ago. I liked the last photo so much I decided to make the next one a bonus. This is my version of the GBSB bias top challenge. We received a copy of the latest book at Crafty and made our own little challange. I used the lace as a focal point as i didn’t have the chevron effect of the stripes. If you want to see our review of the book, From Stitch to Style, check out the lastest Crafty Sew & So post. I will be discussing my recovery, weight loss and disordered eating. It was my plan to post a picture of me wearing a home-made item each day of the month. I’ve been avoiding taking said picture all day. It’s only within the past half hour I’ve realised the reason for this. That will happen if you can’t keep food down for a couple of days. this is not a good thing. I’d never really considered the impact of physical illness on my recovery from an eating disorder. I will not go into detail as I don’t think it will do any good. Suffice to say this stomach virus has brought back unwanted memories. I do not want a picture of me in this top whilst I am not at my healthy weight. So here’s a Photo of me from a little while ago wearing the jersey top I am wearing today.